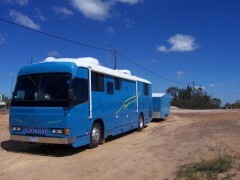 " TRU BLU" is owned by Dave and Shirley Ward from Wherever the motorhome is. coast. If you see it say hello to George. End of an era for us. CTEK multi xs 25000 battery charger. COTEK S1500-212 pure sine wave inverter. All interior lighting LED lights. Dave-retired for over five years worked mostly truck driving with a variety of jobs in between. Shirley- Worked in hospitality, gaming attendant, barperson.